Critique Opportunity ALERT: Miss Snark's What's Broken? If you have a completed manuscript and are struggling with a particular scene, this is a great opportunity for you. Submit 500 words for critique. Submissions open at 8pm TODAY and she is only taking the first five, so you better be quick. You may be wondering why I am reviewing the supplement to Writing the Breakout Novel by Donald Maass instead of the actual book. I'll tell you why. Because it's awesome. Writing the Breakout Novel is great too but if your book buying budget is limited, just buy the workbook. There is no subsitute for learning a concept and then immediately putting it into practice with your own manuscript. Your characters aren't allowed to drink tea, take showers, or drive cars. Okay, not exactly. Here it is as explained by Maass, "...cut scenes set in kitchens or living rooms or cars driving from one place to another, or that involve drinking tea or coffee or taking showers or baths..." He goes on to say that this particular exercise always prompts the most debate in his workshop. That's not surprising. It sounds ridiculous. Maass is not being literal, you can have these things in your book, but there better be a darn good reason. His point is that inexperienced authors often feel the need to give readers a play by play of what their characters do. If your character is at home in one scene decides to go to the park the next day, it is okay for your next scene to start at the park. We assume the character woke up, ate breakfast, and drove their car to the park. You don't have to tell us. What I love about this lesson is that is seems so crazy, you will definitely remember it. Now everytime I read a book I notice these things. Do you have any idea how often they drink tea in Deborah Harkness's A Discovery of Witches? It's a great book, but there is really a lot of tea drinking. Don't get me started on the wine. That leads me to the unpublished author's cardinal rule - Brilliant, bestselling authors can get away with things you can't. Just accept it and move on. Have your characters act out of character. Maass instructs the reader to think of the one thing your character would never do and then find a place in the story for them to do exactly that. I love that one. It's so insane it's genius. That one doesn't need too much explation. It's simple and easy to remember. I often find myself spot checking pages for tension. Of course, Maass suggests checking every page for tension. Put your characters in such perilous situations that success seems unlikely or even impossible. After reading this one, I started to notice this everywhere in popular books, film, and even television. My favorite example is Harry Potter. Take the climax of book 4, Harry, a fourteen year old without any special talent is stranded alone in a graveyard with the most powerful dark wizard in history and an army of his followers. Voldemort wants him dead. Would Harry get out of that alive? Absolutely not. If I could ask Maass one follow up question it would be this. Okay, so I've raised stakes, added complications, and put my character in an impossible situation they can't possibly get out of. So...how do I get them out? Assuming you want your story to be a little bit more upbeat than a Greek tragedy, you have to find a way to uncomplicate your complications in a plausible way. J.K. Rowling created such a believable and living world. She had been teaching us about magic with authority for four novels, so we trusted her. She set it up beforehand. Earlier in the book, she established the twin cores. This is critical for any ending that borders on unbelievable. Ease the reader in with subtle clues. In conclusion, read Writing the Breakout Novel Workbook by Donald Maass immediately. And if you have any more advice about how to resolve the terrible situations you put your characters in, please share!! 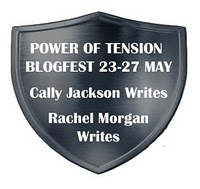 For those of you who also entered the Power of Tension Blogfest, I apologize for the duplicate. My submission to the blogfest also happened to be the first 250 words of my manuscript. The man sat under a bridge with his niece huddled beside him. The black rain seeped through the cracks above and left little pools of ash on the pale skin of the girl’s arms. The child reminded him of a doll that had been left out in the rain and ruined. Her hair was so tangled and matted that he had cut it into short uneven clumps. “Why isn’t the sky blue anymore?” she asked again. The brush nearby crackled and he was there. The child pressed herself closer to him. Each time she asked of them, he felt like his heart would burst. But this would be the last time he would have to say it. I'm not trendy. 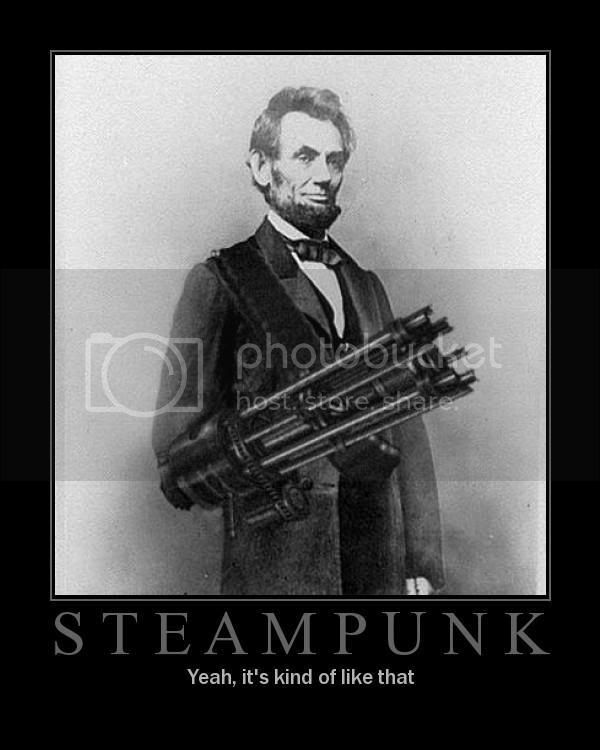 For starters, I just this week learned about steampunk which appears to have been trendy since at least 2007. But for all of you who like me and are not yet aboard the steam train, I introduce you to my first installment of "trends for the untrendy." The most traditional steampunk is set in the Victorian era and highlights futuristic technology as it would be imagined by people from the era, reminiscent of H.G. Wells and Jules Verne. However, steampunk can still be steampunk if it is set in different time periods and/or highlights paranormal elements instead of futuristic technology. For great examples of steampunk, check out Soulless by Gail Carriger and The Girl in the Steel Corset (Steampunk Chronicles) by Kady Cross. Although I am way late catching on to steampunk, it seems that the trend is far from over. I researched it in the first place because agents are looking for it! Steampunk is still steaming. Will is still be hot by time I'd be able to write and edit a steampunk novel? That's not as clear. But if you love steampunk, don't worry about the trend, just write it, read it, and love it. 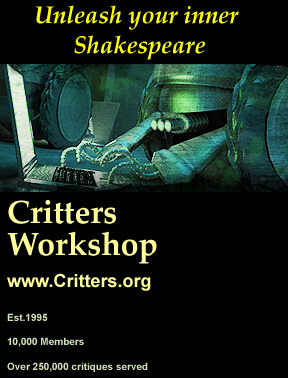 Critters is a free online critique group for science fiction, fantasy, or horror (adult or YA). In my fifteen years as a writer, I've sought critique from a variety of forums (other websites, in person workshops, forcing my family read my work, etc. ), and Critters is my favorite thus far. Critters is the first place I've had good luck in getting my ENTIRE manuscript critiqued. 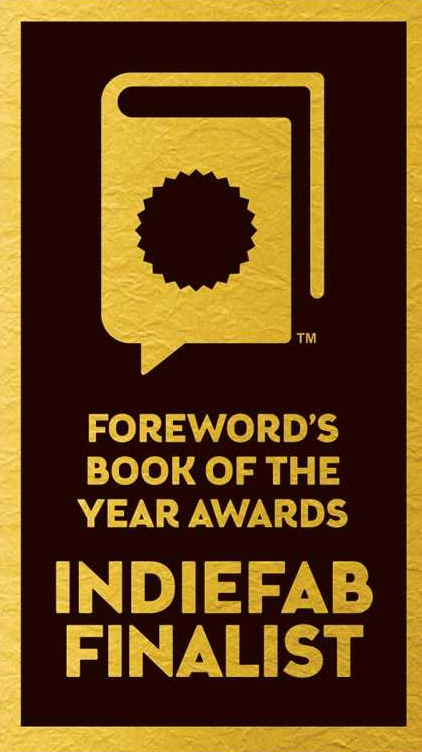 I used the "request for dedicated readers" process and got FIVE intelligent and perceptive fellow writers to read and critique my entire novel. Their critique helped to transform my manuscript into something I am (even more) proud of. I want to personally thank Dr. Andrew Burt and his "minions" for creating and maintaining such a great site. If you're not a science fiction/ fantasy/ horror writer, you still have a home here. Critters recently expanded into http://critique.org/ with critique workshops on everything from literary fiction to website design! And now for my shameless plug...if you do decide to join Critters, check out my revised manuscript for Stormland, up for critique from today until June 1st. The man sat under a bridge with his niece huddled beside him. The black rain seeped through the cracks above and left little pools of ash on the pale skin of the girl’s arms. He moved her over in the hopes of finding a dry spot. The child reminded him of a doll that had been left out in the rain and ruined. Her hair had gotten so tangled and matted that he had had to cut it into short uneven clumps. She deserved something better than this. The brush nearby crackled and in an instant he was there. Far too soon. The child pressed herself closer to him. This is an AGENT JUDGED contest with Judith Engracia of Liza Dawson & Associates. On May 31st, 2011, post the first 250 words at the link below to possibly win a 10 page critique from Judith Engracia. 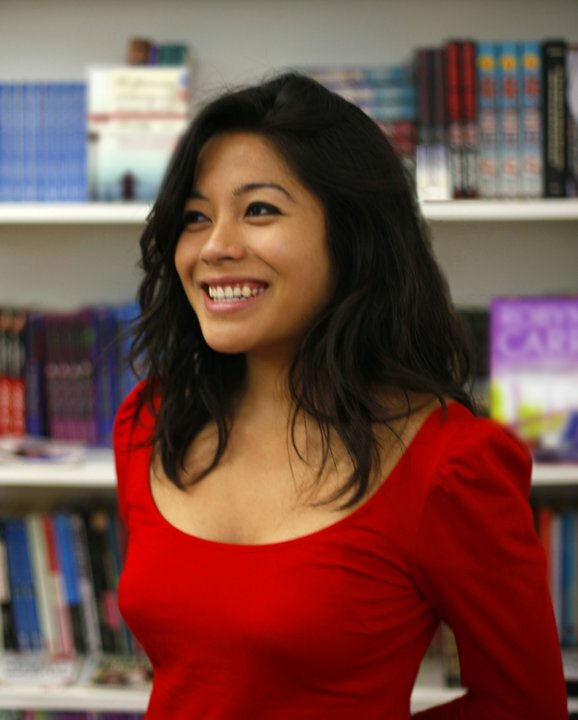 Publisher Elizabeth Law is giving away a 30 page manuscript critique PLUS a thirty minute phone call to discuss. The contest is for manuscripts directed toward younger readers (8 and up). To submit, comment on the post from Cynsational with your email. Due May 31st, 2011. Submit a 300 word excerpt from your unpublished manuscript that embodies tension. 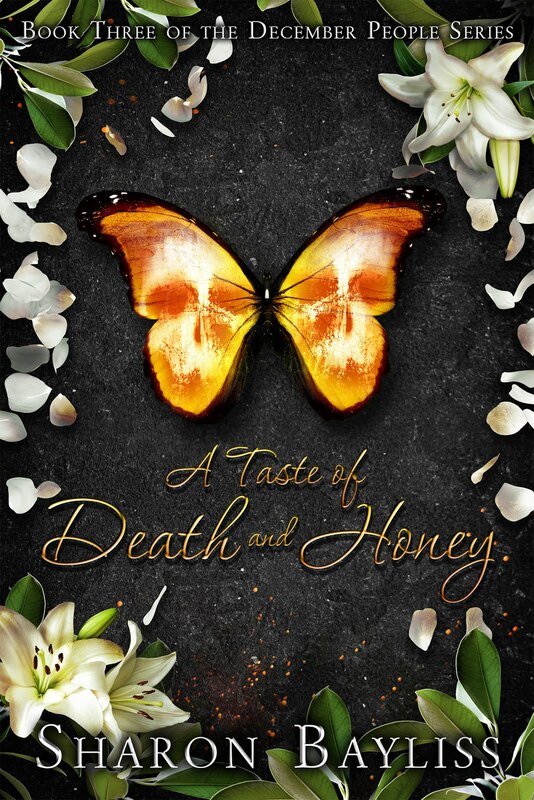 Win an Amazon voucher, interview on Cally Jackson Writes and Rachel Morgan Writes or 1st chapter beta read by Cally and Rachel. Welcome to the Blue Word. The Blue Word is a blog devoted to books and writing in the genres of science fiction, urban fantasy, and paranormal romance, both adult and YA. If you are an aspiring or published writer of these genres, follow this blog to tap into source of news from the blogosphere. 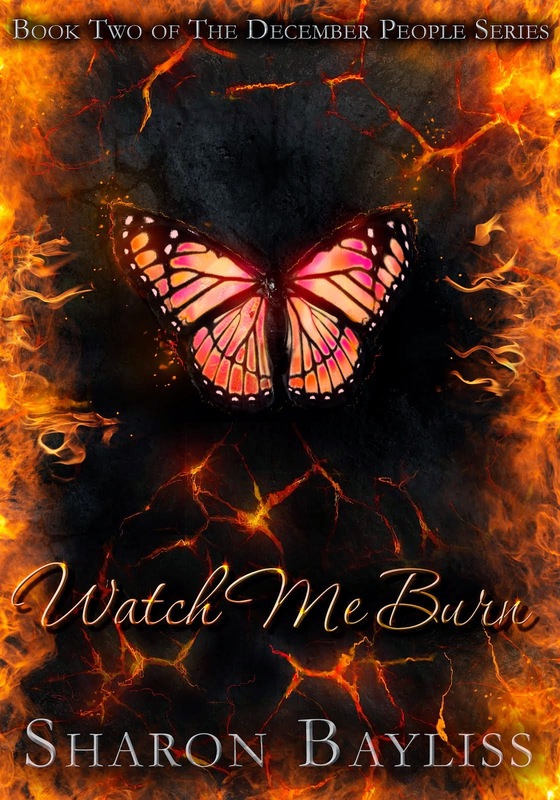 I started following blogs to find CONTESTS to get feedback on my writing and the eyes of an agent, so I promise to post all contests I find...even though I'm tempted to keep the info for myself...maybe I'm a little bit competitive. I am of the philospohy that one should only post when they have something to say. So...my posts will not be daily. 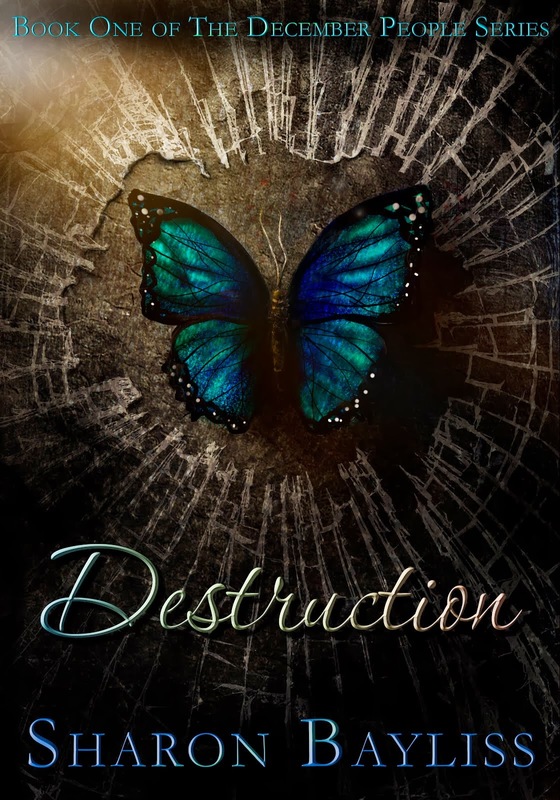 ;) My goal is to help keep you updated and to make connections in the writing community, and of course pimp my unpublished manuscript, Stormland. If you want to know why my word is blue, you'll find the answer there. Please comment and follow.